You can create a list of links on your sidebar that navigate to whatever sites you choose. This list was originally called the “blogroll” because it was created as a list of links to other blogs. 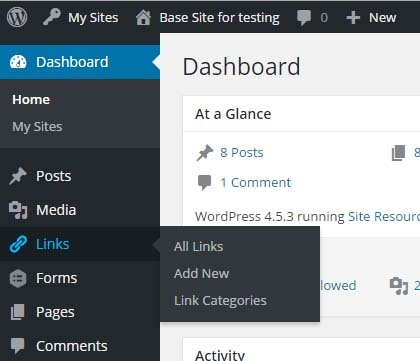 Go to “Links” on the left section of your dashboard. 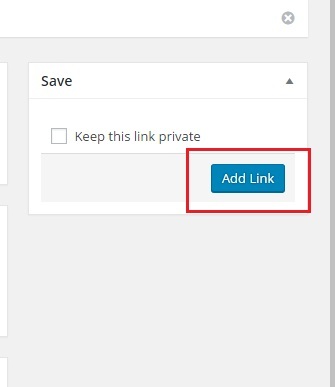 You will see three options: (1) All Links, (2) Add New, and (3) Link Categories. All Links: Lists all the links on your website. 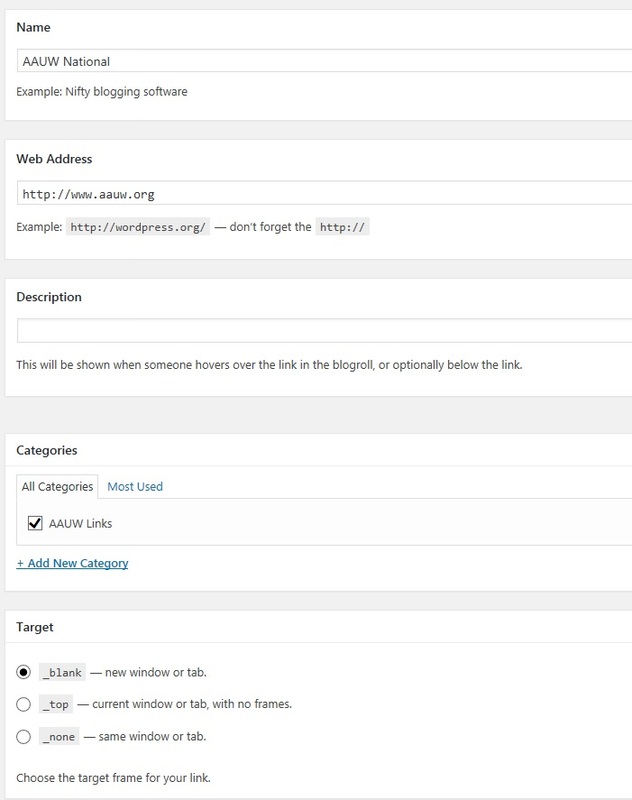 Add New: Adds a new link to a page external from your website. Web address: This is the URL of the webpage you’re linking to. Don’t forget to use the full URL path including http:// (e.g., https://www.aauw.org) whether the link is internal or external. Categories: Select the category or grouping for the link (e.g., AAUW Links). You can also put the same link into multiple categories. Click “+Add New Category” to add a new category. _none: This will open the link in the same window (default setting). This should be used for internal links within your site. _blank: This will open the link in a new window. This should be used for external links outside your website. To add the link, click the “Add Link” button under the Save toolbar on the right. Go back to your website. If the category “AAUW Links” has been added to the right-hand sidebar, you will be able to see a newly added link “AAUW national” link underneath it. If you do not see the green link Category “AAUW Links,” it’s probably because the link widget is not activated in your sidebar. If you are a super editor, follow these guidelines to add a Link Widget to your sidebar (Note: This will be added in the future). If not, contact the AAUW Site Resources manager. Repeat from step two, above, to add more links under “AAUW Links”. This entry was posted in Wordpress Editing Tips on September 30, 2016 by srsupport3.